Welcome to Nemaco Technology's reference section that provides technical information for many types of 19 inch EIA RackMount Computer Server Enclosures & Cabinets. Nemaco Technology designs, manufactures and sells standard and custom 19 inch RackMount Enclosure & Cabinet products in the following NEMA 4 and 4X ratings for industrial computer servers. Nemaco can customize many of the standard 19 inch Rackmount Enclosure & Cabinet product to meet our customer's for outdoor dust, rain, icy snow environments, heavy duty washdown waterproof requirements and also applications requiring chemical and corrosion resistance. Call Nemaco™ to get a Rack Server Cabinet Solution Today! In particular, Nemaco specializes in custom air conditioned rack mount enclosures for water spray resistant, rain proof, washdown waterproof industrial applications. Nemaco can provide standard and customer rack enclosures. All Nemaco Technology's industrial 19" eia rack serrver enclosures and computer cabinet products are available with the following options: enclosures in powdercoat, aluminum and stainless steel, adjustable rack rails (powdercated carbon steel, aluminum and stainless), clear lexan windows, temperature controlled AC cooling, double doors, grounding studs, padlock provisions, sub-panels (powder coated carbon steel & aluminum), single shelf, adjustable shelves, custom cut-outs and many custom colors (including light computer gray, industrial gray, royal blue, sunny orange, super black magic). 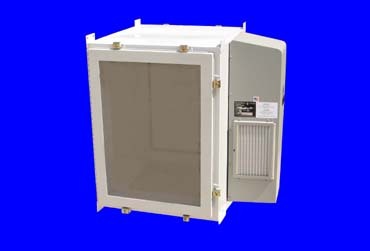 Also, Nemaco can offer NEMA 4 & 4X rackmount enclosures with A/C cooling (air conditioned) and vortex coolers. This vortex coolers have a distinct advantage for keeping the electronics cool and dry for both indoor and outdoor applications. The A/C (air conditioners) units can be attached to the NEM 4 & 4X rack mount enclosures and they keep the electronics cool and dry. And the Air Conditioner units are available from 1,000 to 20,000 BTUs. Call Nemaco about your application and we will get the correct Air Conditioner for your NEMA 4 /4X rack server enclosure. Next, there are vortex coolers that can be install on the NEMA 4 / 4X enclosures to provide cooling also. The vortex coolers work great when there is factory shop air available. Also, the vortex coolers cost about half the price. Also, Nemaco can offer submersible waterproof rack server enclosures in 304 / 316 stainless steel and epoxy coated aluminum. The submersible waterproof rack server enclosures are tough and rugged for industrial applications offshore oil & gas facilities , chemical plants, water treatment plants, military and other specialized applications. Call Nemaco for more information about waterproof enclosures.